Earlier this week we sold top-performing Equifax (EFX) from our Dividend Growers portfolio. Even though it is still a fundamentally strong company, it was hitting a historically high valuation, and a few technicals suggested that now could be a good exit point. Find more details on that decision here. That trade left us with about $85,000 of virtual cash to spend on something new. Per the portfolio’s charter, there should be 25 holdings, with no more than 30% allocated toward any single sector. As it is a dividend growth-themed portfolio, each holding should not only pay a dividend, but should be a growing company with a history of increasing dividends. So this week I set out to find a new stock for the portfolio. I used screeners (including variations on the Dividend Growers screener in the Library) and dug through some of my old dividend growers watchlists to populate a new watchlist of candidates. Because the portfolio is already close to 30% in consumer cyclical, I filtered out consumer cyclical stocks from my view. The portfolio is also heavy in industrials, 26.4% after selling EFX, so while I didn’t rule industrials out, I was hoping to find something in a different sector. While a number of the above stocks were very intriguing and will remain on my watchlist, I found myself most drawn to Owens Corning (OC), a building materials company that I had not previously heard of. 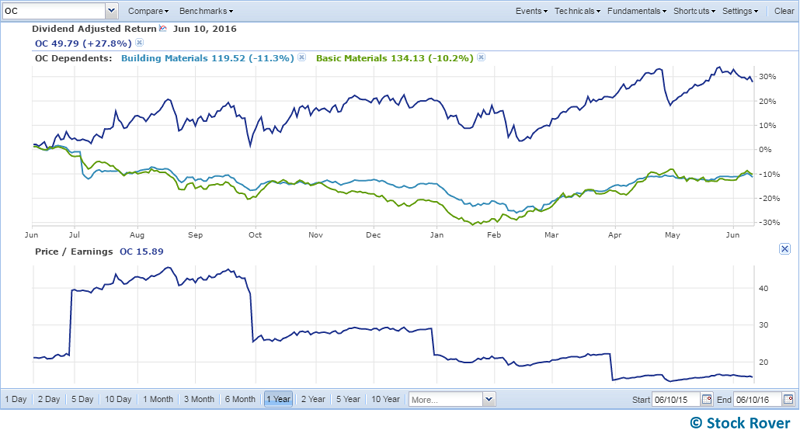 To begin with, it was one of the few tickers I found in the basic materials sector, which has generally been one of the better performing sectors of late, and only one holding in the Dividend Growers belongs to this sector, Eastman Chemical (EMN). Beyond that, it seemed pretty solid in every dimension I looked at. 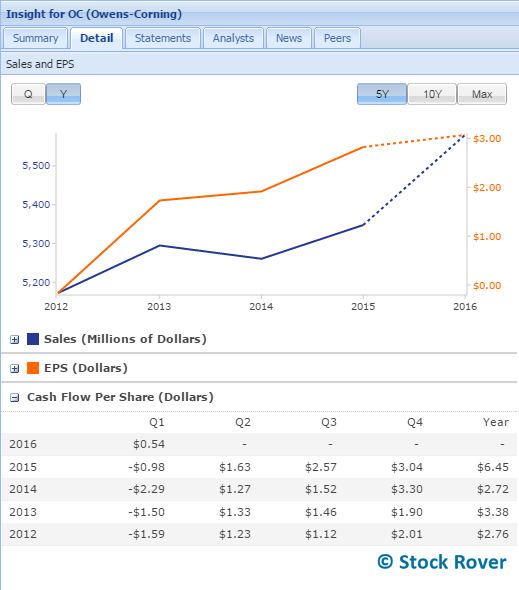 Cash flow has loosely shadowed the revenue trends, including a strong increase in 2015. From the most recent earnings transcript, it appears that the company’s growth strategy is primarily to increasingly capture market-based volume growth, both globally and domestically. Owens Corning is already a market leader in insulation, and it recently acquired roofing materials maker InterWrap, which according to CEO Mike Thaman, is a leader in lumber and metal packaging as well. This shows that the company is becoming more efficient, which speaks well of the management team. This also provides further confidence in the management team. Meanwhile, as we already saw, its valuation is still relatively low, both compared with its industry and compared with its own history. In the second chart above, you can see that its P/E multiple has come down from some pretty lofty levels earlier this year to the much more approachable 15.9. 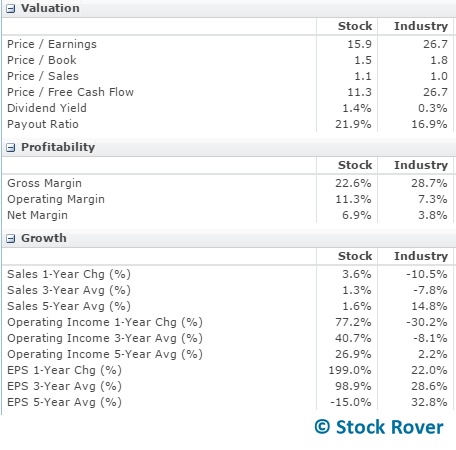 Its forward P/E is an even nicer 14.1, and its PEG forward is at 1.0, suggesting that the stock is aptly priced for its expected growth. With all of the information above, I was feeling pretty warm to OC in general. But since this is a dividend growth portfolio, what about dividends? Without a longer track record on dividends, I see this as a bit of a risk from a dividend perspective. However, I will take the CFO at his word, as the company has in fact steadily reduced the number of shares outstanding since 2007, and it has the free cash flow and low payout ratio to support continued dividend payouts, and ideally dividend increases, in the future. Based on the information above, Owens Corning appears to be a potentially strong long-term pick for the Dividend Growers portfolio, provided that the company makes good on its intention to reward shareholders via dividends. Although its 10-year history isn’t perfect, its more recent earnings history suggests that the company has found its footing and may be poised for a solid run of growth in the coming years. OC is replacing EFX in the portfolio (another company we expect to do great things) and it is about half the price. Time will tell if the trade was a good one. You can download the updated Dividend Growers portfolio from the Library.